Here at Oriental Express, we know first hand the importance of fabric cleaning. From rugs to upholstery to drapery, ensuring that the fabric that adorns the interior of your home is as clean as possible. In many cases, fabric can look clean from the outside, but that doesn’t mean that there are germs, dirt, and dust particles hiding inside the material. That’s why working with an effective drapery cleaning company to ensure your home’s drapes are as clean as can be is highly recommended. Drapes play an important role in a house. Not only are they practical, but they offer an element of design. Good drapes can shield harsh sunlight from entering into a room, while also being a decorative piece that adds to the aesthetic of the space. But just because they are hanging and don’t often come in physical contact with the people in the room, like a big couch of sofa does, doesn’t mean that they are completely clean all the time. In fact, your drapes can easily be affected by germs and dirt particles that are transmitted through the air. That’s why it’s best to get your drapery cleaned at least once every two years, if not more. Because we can’t often see how dirty the drapes are on the exterior, it’s hard to tell when they have accumulated dust and grime. But if left unclean for too long, the germ particles can actually break down the fabric. By getting your drapes cleaned every couple of years, you’ll ensure that your drapes stay in excellent condition. And in many cases, you could increase the lifespan of your drapes just through regular and thorough cleaning. Depending on the material of your drapes, you might be able to clean them yourself. However, that will require dry cleaning, as many types of drapery material cannot be put in the washing machine. Your best option is to hire a cleaning service to do the job. 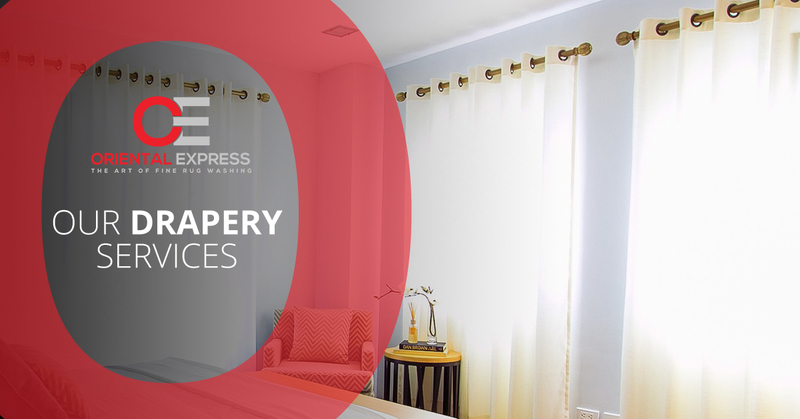 While Oriental Express specializes in rug cleaning and repair services, we also offer drapery cleaning services. Our attention to detail and thoroughness is seen all throughout the services we provide, whether that be rug cleaning, upholstered furniture cleaning, and drapery cleaning. When it comes to the fabric in your house, you’ll want a thorough clean done effectively and efficiently the first time around. If you’re looking to get your drapery cleaned by a professional in Las Vegas, look no further than Oriental Express. Give us a call today to learn more about this service and to schedule an appointment.